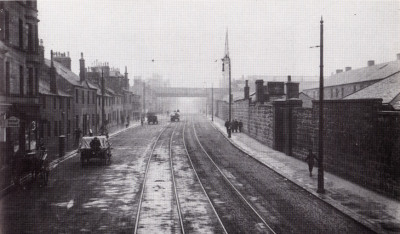 This was a very costly operation which included the building of 15 bridges , an enormous wall down the length of Lacy Street , three signal boxes and two stations at Dykebar and Paisley East. 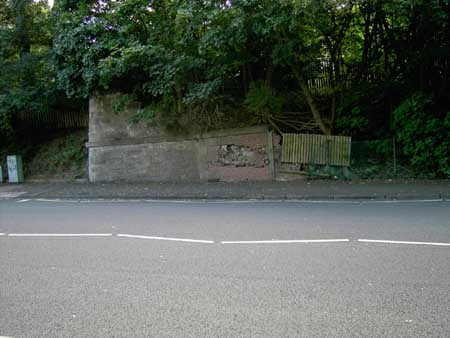 The high level Paisley East section along the wall was never used, however the branch continued into Paisley East Goods (which contained a coal depot) at Cecil Street crossing Lacy Street at street level with the aid of a level crossing. 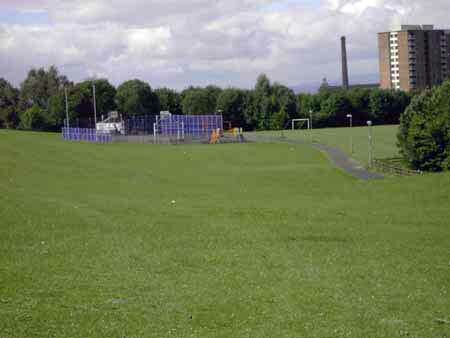 This was situated on the north side of Glasgow Road on the site of what became the Kelburn cinema, now the Kelburn Retirement Flats near the Sherwood Church. 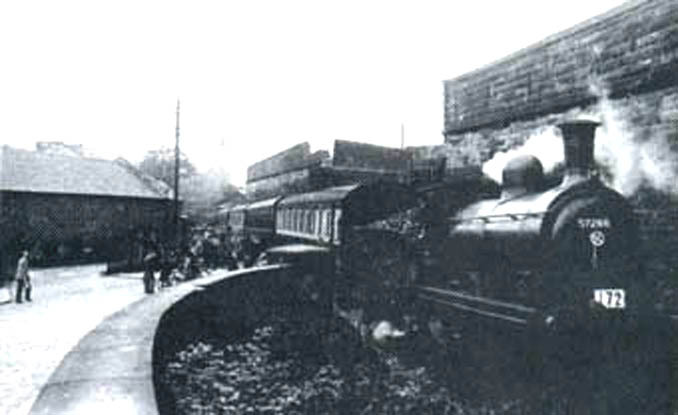 The station was first turned into a garage then demolished in 1928. 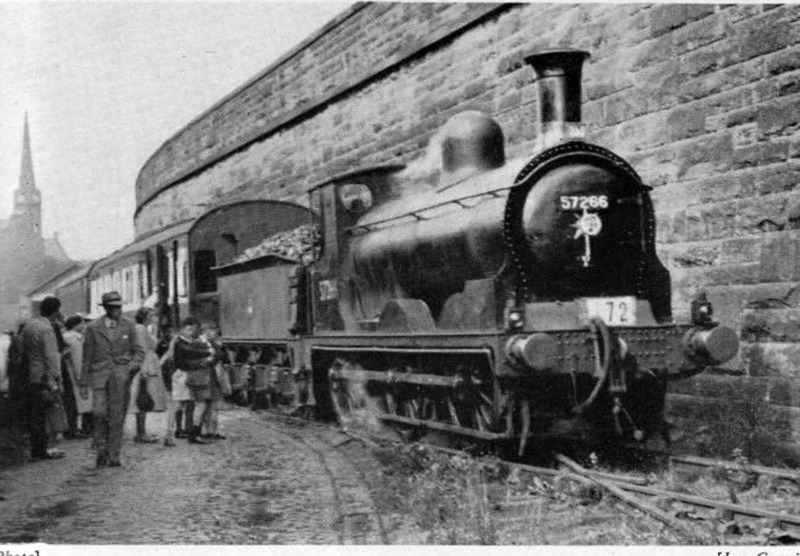 The two left hand pictures below are of a special train enthusiast excursion in 1951 leaving Paisley East goods yard (including John Lyon's coal depot) which was situated to the north of Cecil Street and basically at the other side of Glasgow Road from the station. 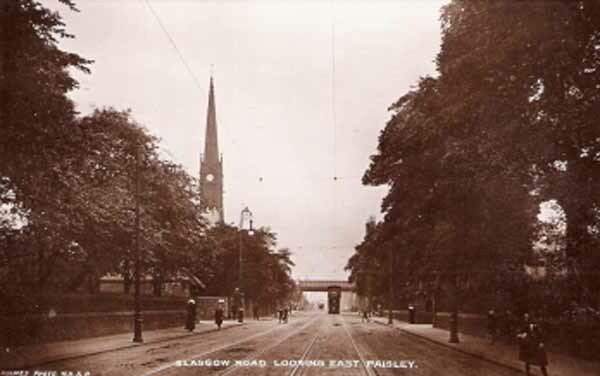 The bridge over Lacy Street to Paisley East had obviously been removed by that time. There was a military barracks at the same side of Lacy Street . The location of the station and the goods yard can be fixed today because the John Lyon's coal shop is still there with a lion above the entrance. It is now a hairdresser's. 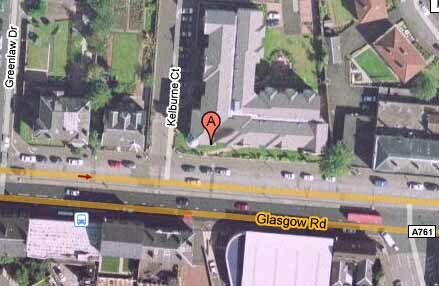 A google satellite photo in the middle shows the approximate position of the station at the other side of Glasgow Road. Thanks to Colin Miller for the information and photograph. 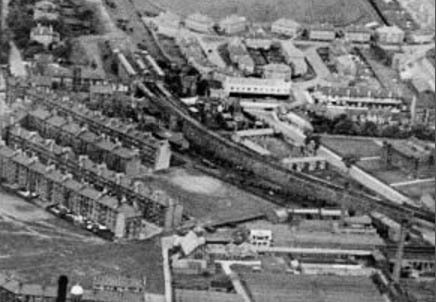 A 1949 aerial photo with the Dummy Railway wall up Lacy Street (middle right to left), the Grammar school, the Kelburne Cinema and the Sherwood Church. 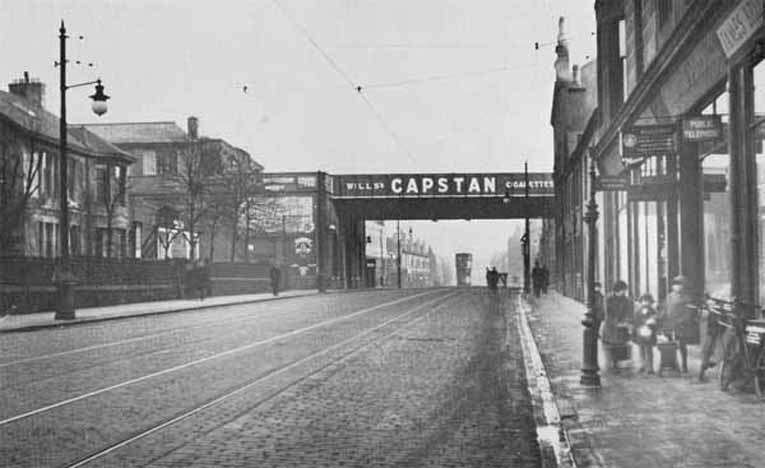 The railway can be seen leaving the back of the cinema. 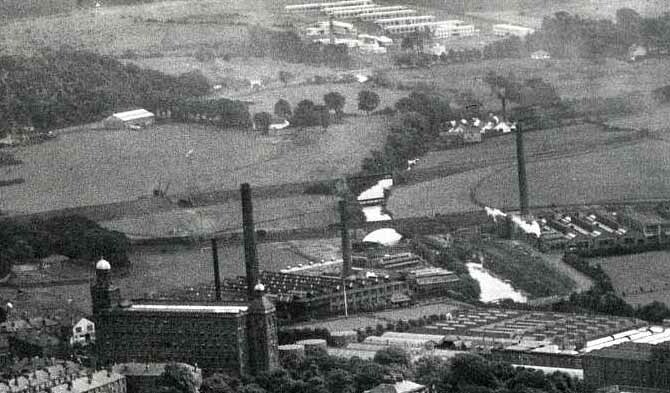 Another aerial photo showing the bridge over the cart used as a short cut from Hunterhill to Seedhil Road and beyond. The canal bridge, Auchentorlie House and Jennny's Well laundry can be seen too. 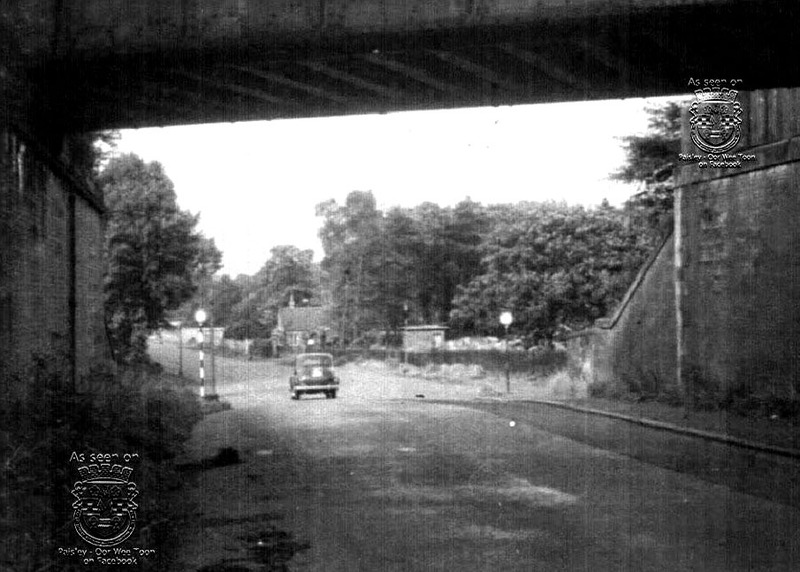 The next photograph, taken in February 1960 shows two men crossing the bridge over Seedhill Road which was apparently a favourite shortcut from Hunterhill. Only one train a day made its way from Barrhead so it was safe as long as you knew when it left and returned. The high level route to Paisley East can be seen fenced off and the low level line into the coal yard is on the left. 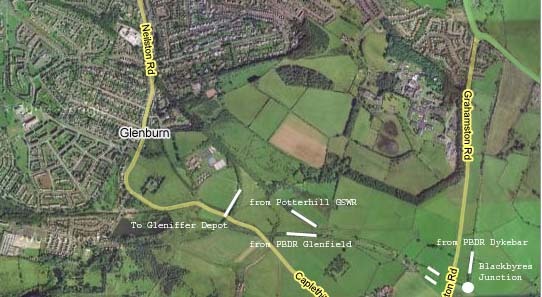 From there, the railway crossed the Canal line at the other side of Seedhill Road (the remains of the bridge can still be seen) and crossed the River Cart only a hundred yards or so from the Canal line behind the Hunterhill high flats. The bridge was demolished in the late '60s but a platform has been built allowing viewing of the river and the other side of the bridge which is now beside the Ciba Geigy factory. See photograph and satellite image below. Anecdotal evidence suggest there was a siding into what was once Jenny's Well laundry. The buildings are visible in the right hand satellite photo at the river. 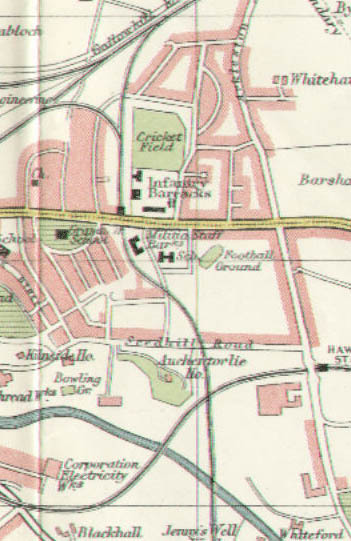 The area with the railway can be seen in a 1931 scout map on the right. 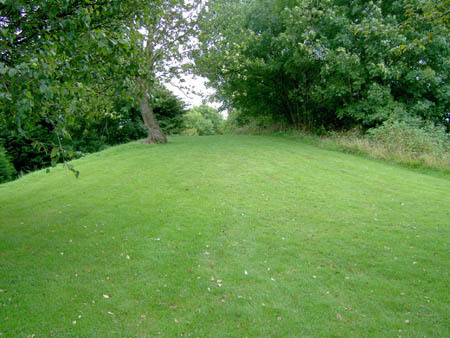 The route came through the back of what is now Dobbie's garden centre . 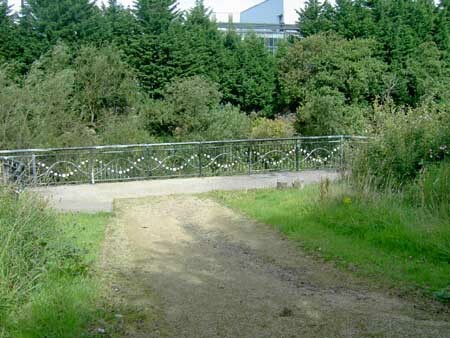 The remains of a bridge at the pedestrian crossing on Hawkhead Road near the Barrhead Road roundabout can be seen below. Dykebar station was only a few yards from the bridge on Hawkhead Road. The station was converted to a two-room and kitchen house before being dismantled by vandals in the late 1960s. The three pictures below are of the station platform with the station building and a passenger shelter which has 'Dykebar' on the front. 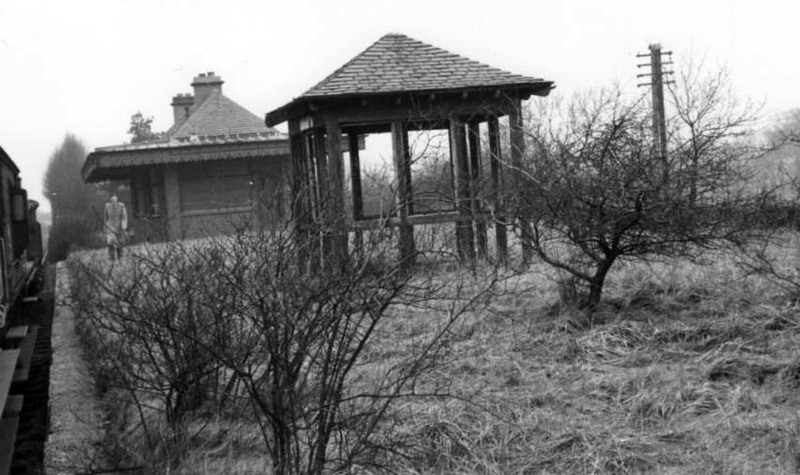 The back entrance to Ross House and a distinctive wall which is still partially intact can be seen behind the shelter. The first one is from 1964 when the line was disused, the second two from 1960 just before it closed. 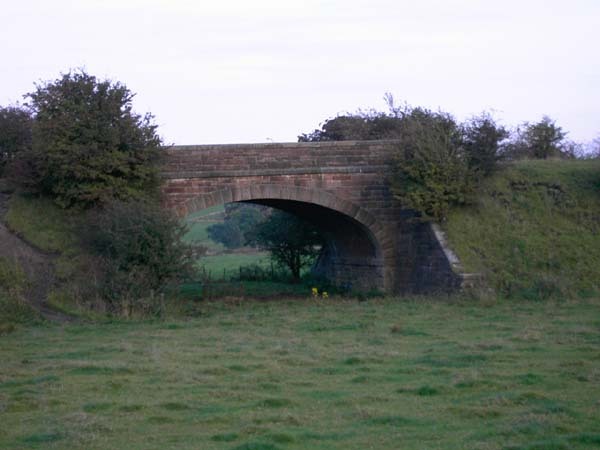 There is actually what looks like a railway bridge in the middle of the field behind where the station was, as well as what looks like a former trackbed nearby (right middle and left below). The only structure on the site of the station is the wall in the middle left picture. 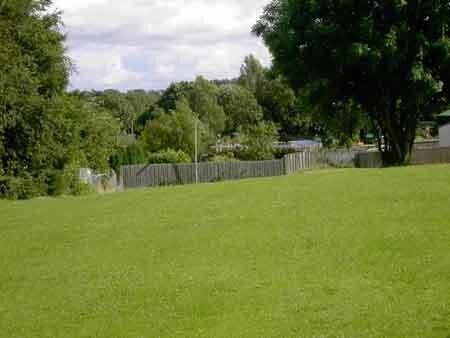 The fence visible behind it was roughly on the outer edge of the railway line. The position of Ross House pinpoints the location of the station (left below). 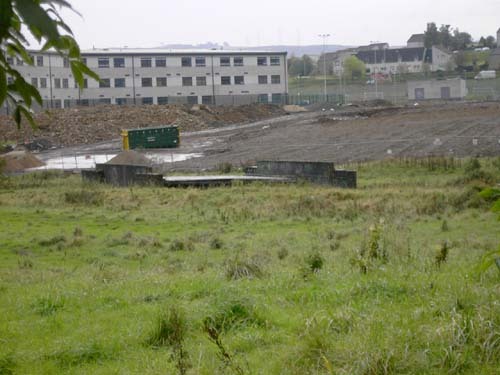 The railway embankment can easily be seen opposite the new St Andrews Academy school on Ben Nevis Road in the Hawkhead estate (right below) and there was also a bridge across the Hurlet Road near the Barrhead Road roundabout . Dykebar Hospital "I certainly can remember a goods train which came from Paisley and delivered coal to Dykebar Hospital, Barrhead Gasworks and finally to Barrhead South Station where it delivered wagons of coal to Thos. Mcdonald Ltd and tankers of tar to the Dussick & Bitumen Co. Ltd. It also made the odd delivery of draff to West Arthurlie farm. This was used as cattle feed." Taken from a Barrhead history website. The satellite image above shows the line curving in. 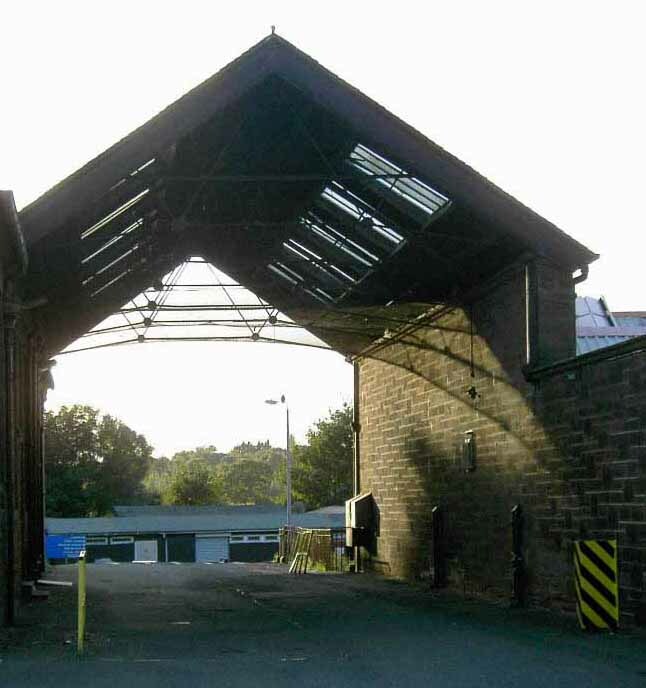 There is still a train shed in the grounds beside the boiler house. The railway entrance is now the main entrance and the original ornate gates (a few yards away) are closed. 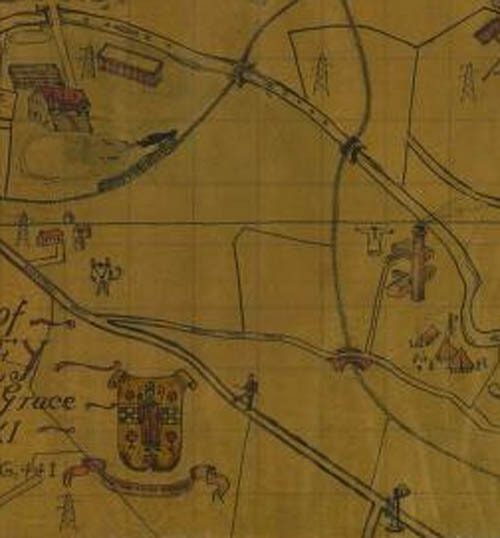 It is possible to follow the route of the former railway from the River Cart crossing to Grahamston Road on the current online Ordnance Survey map by entering grid reference NS502626 and from there to Blackbyres at NS502610 where it is labelled a 'dismantled railway'. 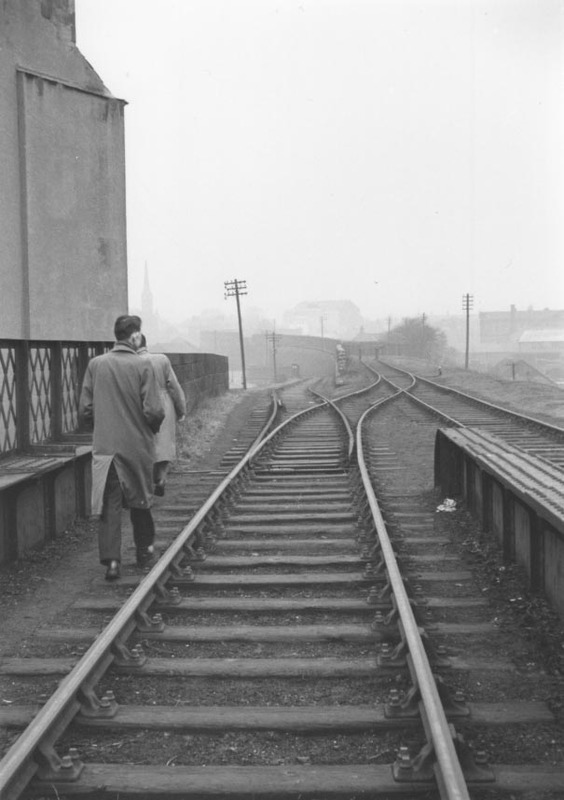 The line from Blackbyres to Paisley East goods closed on 31 December 1960.